Draft: 2014, Baltimore Orioles, 8th rd. Originally selected by the Boston Red Sox in the 15th round of the 2010 First-Year Player Draft (did not sign)...Signed by Rich Morales... Attended Clemson University (SC) and Pope (GA) HS. Recorded his first Major League hit and RBI with a single in the ninth inning on 6/22 at ATL..Had his contract selected from Triple-A Norfolk on 6/19 and made his Major League debut on 6/20 at WSH, entering the game in the ninth inning with one out as a defensive replacement at third base...Made his first career start on 6/21 at WSH at third base (0-for-2, 1 BB)...Notched his first career extra-base hit (double) and first multi-hit game on 7/1 vs. LAA...Placed on the disabled list on 7/3 with a left oblique strain...Hit .263 (26-for-99) with seven doubles, four home runs, 16 runs, and 15 RBI in 27 minor league games during the season; started at each of 2B, SS, 3B, LF, and RF while on defense. March 28, 2019 Baltimore Orioles sent 2B Stevie Wilkerson outright to Norfolk Tides. 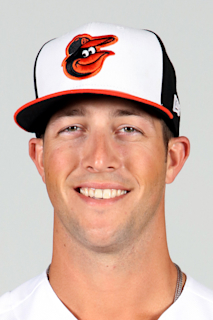 March 23, 2019 Baltimore Orioles designated 2B Stevie Wilkerson for assignment. March 17, 2019 Baltimore Orioles optioned 2B Stevie Wilkerson to Norfolk Tides. September 5, 2018 Baltimore Orioles recalled Stevie Wilkerson from Norfolk Tides. August 24, 2018 Norfolk Tides placed 2B Steve Wilkerson on the 7-day disabled list retroactive to August 23, 2018. August 21, 2018 Baltimore Orioles optioned 3B Steve Wilkerson to Norfolk Tides. August 16, 2018 GCL Orioles sent 3B Steve Wilkerson on a rehab assignment to Bowie Baysox. August 14, 2018 Baltimore Orioles sent 3B Steve Wilkerson on a rehab assignment to GCL Orioles. July 3, 2018 Steve Wilkerson roster status changed by Baltimore Orioles. June 27, 2018 Baltimore Orioles recalled 3B Steve Wilkerson from Norfolk Tides. June 23, 2018 Baltimore Orioles optioned 3B Steve Wilkerson to Norfolk Tides. June 19, 2018 Baltimore Orioles selected the contract of Steve Wilkerson from Norfolk Tides. May 30, 2018 3B Steve Wilkerson assigned to Norfolk Tides from Bowie Baysox. April 5, 2018 Bowie Baysox placed 3B Steve Wilkerson on the restricted list. December 12, 2017 3B Steve Wilkerson roster status changed by Bowie Baysox. May 23, 2017 3B Steve Wilkerson assigned to Bowie Baysox from Frederick Keys. July 11, 2016 2B Stephen Wilkerson assigned to Frederick Keys from Bowie Baysox. July 6, 2016 2B Stephen Wilkerson assigned to Bowie Baysox from Frederick Keys. June 23, 2016 Frederick Keys activated 2B Stephen Wilkerson from the 7-day disabled list. April 3, 2016 2B Stephen Wilkerson assigned to Frederick Keys from Delmarva Shorebirds. March 4, 2016 2B Stephen Wilkerson assigned to Baltimore Orioles. August 21, 2015 Delmarva Shorebirds activated 2B Stephen Wilkerson from the 7-day disabled list. August 3, 2015 Delmarva Shorebirds placed 2B Stephen Wilkerson on the 7-day disabled list. June 9, 2015 Delmarva Shorebirds activated 2B Stephen Wilkerson from the 7-day disabled list. May 24, 2015 Delmarva Shorebirds placed 2B Stephen Wilkerson on the 7-day disabled list retroactive to May 23, 2015. April 23, 2015 2B Stephen Wilkerson assigned to Delmarva Shorebirds from Aberdeen IronBirds. April 15, 2015 2B Stephen Wilkerson assigned to Aberdeen IronBirds from Delmarva Shorebirds. April 4, 2015 2B Stephen Wilkerson assigned to Delmarva Shorebirds from Aberdeen IronBirds. June 13, 2014 2B Stephen Wilkerson assigned to Aberdeen IronBirds. June 12, 2014 Baltimore Orioles signed SS Stephen Wilkerson.